Coral warfare is a real thing both in the ocean and in reef tanks. Every inch of rock or sandbed is fair game for a fight for real estate. To assert dominance, corals use warfare to destroy neighbors and to claim their territory. Except one coral that plays nice – zoanthids. Zoanthids won’t throw out sweeper tentacles or throw out their insides in an effort to fight off a neighboring coral. Zoanthids simply grow where there is available real estate, yielding to their neighbor’s existing territory. Therefore, zoanthids are a great coral to use to fill in gaps between corals, even s.p.s. corals. 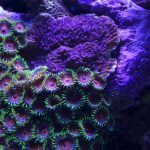 Zoas will grow right up to the neighboring coral and then stop. The worst thing a zoanthid will do is shade another coral, in which case the offending zoa can be removed with scissors or a razor blade. If you’re looking to fill in gaps between corals, zoanthids are your answer. Really useful info. Didn’t know that. It’s ironic because I have several different Zoa colonies and to save room in my tank, I considered bringing them closer to each other or even touch. But the research I did online indicated that some zoa colonies are not compatible with each other. Jedi Mind Trick and Sunset Monti. Right now there seems to be a peace between them (one ends where one begins). Same Jedi Mind Trick killed one of my Caulestra heads and is closing in on the other. Then there are the remnants of a huge Superman Monti colony, I gave to my LFS. Some traces have grown and are encroaching on some of my Acros. I could just scrape the monti off the rock, but I’m leery of causing a cave in. So your idea for the Zoa’s as a “shield” made sense. But then I realized it would simply grow in the space I have allocated for my acros. I guess this would work if you have two colonies that have already pretty much grown out so you would seed the zoa’s between them.